Every ritual or tradition has a set of values and customs unique to them. The Hindu Wedding ceremony is no different in this aspect. The Big Fat Indian Wedding is only reputed for being so grand because of the various ceremonies that it entails, the same are explained below. Achamanc – It is a Hindu Wedding ceremony ritual wherein one sips a small amount of water. This is regarded as a purification process and is also conducive to a peaceful state of mind. Angasparsha – This refers to touching one’s limbs with two middle fingers of one’s right hand, with a little water. This is leu of praying for a strength and alertness. Madhupraka ceremony – Madhupraka refers to a drink offered by the parents of the bride to the bridegroom which is to mark or symbolize sweetness and joy. The drink is made out of honey, curd, and ghee, also known as clarified butter. Kanya Daan – This is one of the most important rituals of any Hindu Wedding ceremony. In this ceremony, the parents of the bride give her away, rather entrust her to the bridegroom. Vivah-homa – The vivah-homa is a havan yagna or a fire ritual with which all sacred rituals among the Vedic religion commence with. The ideology behind the ceremony of the vivah-homa is to begin all auspicious undertakings in an atmosphere that spreads purity and spirituality. The atmosphere is set with the burning of herbs with the help of ghee and the chanting of mantras. 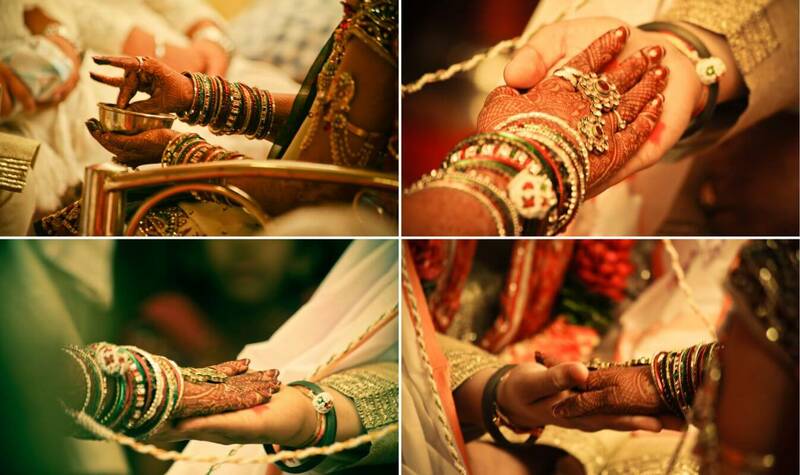 Pani Grahanam – This ritual marks the acceptance of the bride as his wife, by the bridegroom. The process of the ritual requires the bridegroom to raise the hand of the bride with his left hand as a symbol of his protection and their progeny, to follow the path of virtue together and overcome all hurdles so that they are able to lead a prosperous and happy life. Pratigna-karanam – As a part of this ritual of a Hindu Wedding ceremony, the couple take circles around the auspicious fire and make vows to each other during the process. The vows entail those of loyalty, steadfast love, and life-long fidelity. Shilarohanam – Shila refers to a stone and arohan refers to the act of ascending. Here, the mother of the bride helps her to ascend the stone and counsels for the life that lies ahead. The counselling is about the married life she is about to enter and the steadfast love and duty she should partake in. Laja Homa – In this stage of the Hindu Wedding ceremony, offerings are given to the sacred fire. The brother of the bride puts rice into her hands, which slips into the hands of the bridegroom, underneath hers, which thereafter falls into the fire. The process is repeated thrice. The ceremony is performed as a prayer offered to the God of death, Yama, for the long and prosperous life of the bridegroom. Agni Parikrama or Mangal Phera or Pradakshina – This is another one of the most auspicious ceremonies wherein the couple walks around the fire four times. It is common belief that the moon provides protection for the bride during the first seven years of her married life. The following seven years is protected by the sun, after which, agni or fire acts as her custodian. For this reason, respect is paid to agni through this custom. Saptapadi – For this ceremony, the end of the scarf of the bridegroom and the upper garment or the dupatta of the bride are tied together by the priest. The knot is a symbol of their marriage. After the tying of the knot uncooked grains of rice is placed at equal distances in a line, in seven places. The bride and the bridegroom have to take seven steps together to the recitation of mantras, made by the priest. Each step taken by them is significant of a different aspect of marriage. These aspects are in lieu of upholding the aims of being true companions in marriage. 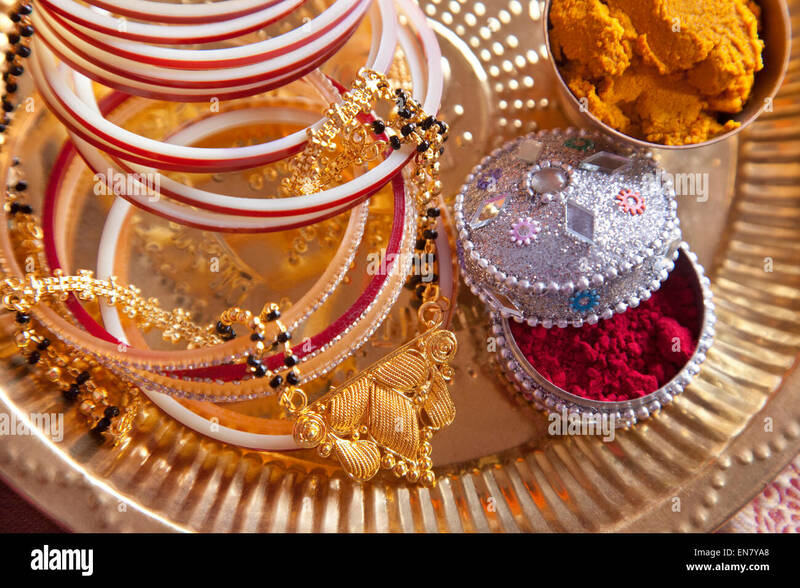 Saubhagya-chinha – In this ceremony, the bridegroom gives his blessings to the bride by applying sindur to her parting of her hair at the hairline and tying the mangalsutra around the neck. Abhishekh, Surya Darshan, and Dhruva Dhyaanam Darshanam va – For this Hindu Wedding Ceremony, the priest sprinkles some water over the couple. After this, both of them meditate under the sun and pray for power and a creative and meaningful life. After meditating to the sun, the couple meditates to the pole star and the star named Arundhati. The ideology behind the couple praying to the pole star is to remain steady and steadfast like the stationary position of the star. Anna Prashanam – In this last symbolic ritual the couple makes offerings in the form of food into the sacred fire along with the chants of the Vedic Havan Mantras. Having gone through this ritual, the couple feeds each other a morsel of food each which symbolizes the love that they are to share. Aashirvadah – This is the final stage of the Hindu wedding ceremony where the elders bless the newly-wed couple. The first blessings are imparted by the priest after which the elders follow.